Polyfoam Laminating Board is suitable for thermal and structural insulation as a fabrication board for a wide variety of manufacturing processes and applications. The thermal conductivity of Polyfoam Laminating Board is 0.033W/mK. Polyfoam Laminating Board is a rigid extruded polystyrene (XPS) board with a Global Warming Potential (GWP) of less than 5 and Zero Ozone Depletion Potential (ODP). 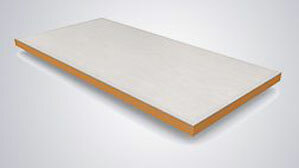 Polyfoam Laminating Board is lightweight and has excellent structural strength. Polyfoam Laminating Board represents no known threat to the environment, has zero Ozone Depletion Potential (ODP) and is manufactured in the UK using a blowing agent with a low Global Warming Potential (GWP). 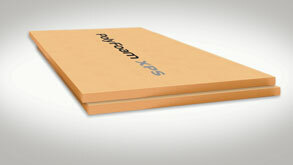 Polyfoam Laminating Board is non bio-degradable and 100% recyclable. The continuous service temperature limits of Polyfoam Laminating Board are -50 to +70º C.
Polyfoam Laminating Board is highly resistant to compression and can withstand both occasional and long term static loads. Load bearing construction elements should be designed to adequately support the combination of imposed and dead loads without creating excessive deflection. 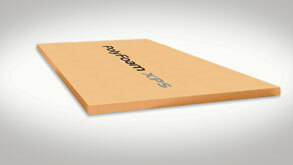 Polyfoam Laminating Board – 625MNs/g.m, when tested in accordance with EN 12086. The moisture absorption of Polyfoam Laminating Board is 1.5% by volume when tested in accordance with EN 12087. Polyfoam Laminating Board is resistant to moisture absorption and can be installed in standing water, high humidity factory conditions or up against wet surfaces with negligible impact on the performance of the product. Polyfoam Laminating Board is supplied on a pallet secured with tape and designed to be easily recognised and labelled with identifying product and manufacturing data. The boards are easy to handle and protective clothing is not required when installing them. Ensure the boards are not stored close to open flames or other ignition sources and avoid volatile organic compounds and chemicals such as solvents. Polyfoam Laminating Board should not be left exposed to prolonged sunlight as this will result in surface degradation. When outside storage for extended periods is required cover the products with opaque/light coloured sheeting.